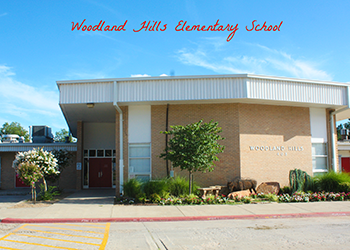 Woodland Hills opened its doors to our first students during the 1968 - 1969 school year, and for its day, represented a whole new look for schools in our city. With its movable walls, it easily accommodated team teaching. Six additional classrooms, the library, and the music room were then added in 1983. With a projected growth in enrollment, due to the military plans for BRAC , the district built eight additional classrooms that were completed in August 2006. In October 2007, a partial wall between the library and the music room, which is now our computer lab, was opened to create more room for out library books and to be able to monitor our lab. This is Woodland's 46th year to serve elementary students. Currently we are serving 388 students ranging from kindergarten to fifth grade. We have 25 certified staff and 10 support staff. Our student population during the last 13 years has maintained a constant enrollment of approximately 480 increasing in 2007-2008 school year by 25 students. The 2008-2009 school year reflects a change in numbers due to our sixth grade students going to middle school. However, our enrollment will continue to increase as BRAC families move into our community. Our students have a reputation of excelling in academics in junior, high school, and college. We strongly believe this is the result of a combination of the commitment shown by our staff members daily and the sense of school family. The students, parents, and faculty work closely together to ensure academic success for our students. The wide array of co-curricular activities enhance the overall growth of our students. Parents are actively engaged in coaching our youth in soccer, football, basketball, T-ball, baseball, softball, scouting, and cheerleading. Woodland Hills has been a model Great Expectations school for 6 years. We have 90% of our staff trained and implementing the life principles.